I'm in Kanab, UT this weekend for a short vacation and business. Technically Linda has the business and I'm on a mini vacation. The Western Roundup is a favorite of Linda's on the Jewelry show lineup. This is one of the reasons we recently purchased our trailer. Staying at the local KOA with full hookup makes the long hot day's easier for her. Having a base camp a few miles from some of the greatest hiking in the world is a bonus. Linda drove down yesterday to set up shop, while I put in a productive day at the office. We met just in time for dinner with friends from St. George. They also have a booth and really took a liking to Linda at her first show. They help her off and on with breaks etc. Wonderful people. For me the agenda is fairly simple. Hike. Climb. Repeat. Toward the end of August but mostly in September and October are my most productive hiking / climbing months. I summit more peaks in these two months than at any other time of the year (April and May come a close second). The reason is pretty straight forward. Long days but cooler days are the norm. So I'm excited to get an early start to this season. Linda's up and ready to go by 8:00 am. I've decided to take my chance at a walk in permit for The Wave. The lottery system at the Kanab field office is efficient and routine. Show up between 8:30 am and 9:00 am. Have an application filled out and turned in before 9:00 am. Only ten permits are offered as walk in permits. Another ten permits are offered online but cost $7.00 just for the chance of winning. The walk in permits only cost $7.00 if you win. A person can add up to 5 additional names (6 total) and if they win all 6 people receive a permit. If a group of 6 win the first round that means only 4 additional people can go. If the second application chosen also has 6 they have to determine which of the 4 out of the group of 6 go, or they can turn the permit down. The waiting room is full when I arrive (as usual) but only about half the number of applications are in process. Thirty-two compared to 64 applications the last time I applied. After all the applications are received a roll call is made to ensure everyone is present and a number is assigned. I am number 15. A lottery ball roller is presented to the group and 32 balls enter the basket spinner. It really is fun because it's a given that the majority of people will not be going. But everyone seems to have a good spirit about it. The first number is called. He is a single, so 9 more people can still go. People cheer and clap because it's always a bummer when the first person takes 6 permits. The second group is 2, then another single. The couple standing across the hall from me are drawn, then another group of 2. Then number 15 rolls from the cage!! The rest are called and most groups are small. It's the first time I've seen such a large diverse group get chosen. Usually it's basically 2 groups, one 6 the other 4. I hadn't expected to win so I don't have any cash. They excuse me to run to the ATM across the street. Permit in hand, I'm excited for tomorrow. I top off the gas tank at the same location I withdrew the cash from the ATM, unfortunately no Power Ball lottery tickets are available. Still in Utah I guess. I'm headed East toward Fivemile Mountain. Fivemile is basically a drive to summit. Not quite, but I chose Fivemile to test road conditions. The Kanab, UT area got slammed with rain yesterday which lasted for 15 hours (according to locals). There is water and mud everywhere. The restaurant we ate at last night was still shoveling mud from the driveway and parking lot. This is the desert however and the many amazing slot canyons that this are is famous for were created in just such a way. Fivemile Mountain road cautions as an unimproved road, but I find it in good condition. The road is made of mostly gravel and not the clay found at the lower elevations. A few puddles and mud patches exist but they are short and far apart. I follow the GPS to the closest range to the summit. I park and hike up the small rise. The summit itself is non-eventful. A pile of rocks surround the geological survey marker and a medicine bottle marks a geocache. I look around for a few minutes and decide to wander further east to what I assume is some kind of view point down into House Rock Valley Road. Within a few hundred yards the view opens up to an amazing sight. Highway 89 can be seen heading east. I follow it with my eye and pick out the spot one would turn onto Cottowood Wash Road. Looking north the Cockscomb is visible along with Yellow Rock and Castle Rock. Looking south the Coyote Buttes are mesmerizing in their layers of colorful sandstone. I can pick out the dark slash of rock used as a visual marker for The Wave and I try to spot the two ranked peaks in the area. I'm hoping to summit Top Rock tomorrow along with a detailed visit of The Wave. An unnamed peak 5691 sit's directly across from me as I marvel at the view. Sitting on a rock and eating a snack I review the GPS log for roads. If memory serves me right a road works its way down the eastern side of Fivemile Mountain. I assume roughly following the power lines in the area that are coming from Glen Canyon Dam. Looking across canyon I can see the connecting road working its way up the hillside - albeit further south from the main peak of 5691. I decide to check it out and if possible summit this second peak before returning back to Kanab. Following the road down the eastern face is slow but steady. The rocky hillside showing little evidence of the torrential downpour that Kanab Experienced. Reaching House Rock Valley road I note few tracks. The clay is dry in this section of the road, but I know that can be deceiving. I had noted one car slowly making its way south earlier as I descended Fivemile peak but the soft clay shows little activity on this normally busy byway. I cross House Rock Valley road and begin my ascent up the other side. This could be tricky as I come to my first wash and I have to swing wide to avoid a section of the road that has been washed away. The road itself is cut into and follows the contour of the face of the mountain as I switch back and forth up the hillside. I've been following a set of tracks the are probably only hours earlier than mine. They have definitely been made after the rain, so I haven't been to worried about the condition of the road. After the next turn and a wide wash the visible tracks take advantage of the wide spot in the road to turn around. Should I be worried now? My map shows the road up and over the ridge line. A connecting road travels north along the base of peak 5691 which I assume from the TOPO is a plateau of sorts. This is where I hope to start my climb as It will be a more gentle slope and closer to the summit. Several spots in the road now have large - uneven (but flat) boulders which my Jeep has to climb up and over to continue onward. This next section however looks questionable. I pick the best line and inch forward. Dead stop. A little gas and the tires spin in the soft dirt. I am near the top on a narrow saddle of dirt, so I don't push it. Walking around the FJ, I think my best bet is to back up to the opposite wall of the saddle and try to turn around. I give thanks for the jeeps very narrow turning radius. Twice more I would circle the jeep to verify lines and direction. I am cautious of getting too close to the edge after all the rain, the edges are bound to be soft and crumble easy. With my 6 point turn complete, I head back down the mountain. After a few feet I stop and consider if I should park and hike the rest of the way to the ridge line. GPS puts the summit at just under a mile, and hiking the ridge line is generally better than a bottom up ascent. But I can't just leave my FJ parked in the middle of the road, even as unlikely as it is that someone would also come in this direction. Looking again at my turn around spot I determine it is just to narrow. Giving up on the thought I put the vehicle in gear. No sooner than the next turn I see a wide spot. It's close but I exit the jeep again to check. It will fit?? I climb back in a slowly move into position. I'm halfway up a hill so the rear door almost drags the ground when I get my pack, but there is room for another vehicle to pass as I begin my ascent back up the hill on foot. Wide? Spot in the road. The ridge line is a rocky backbone jutting through the sandy surface. I angle my ascent to skirt the side of the hill versus a straight approach to the top. The summit is along way away and I don't want to climb every high point between here and there. The hiking is reasonable but sandy as I trudge along the eastern slope. The view is breathtaking as I move from east to western slopes. 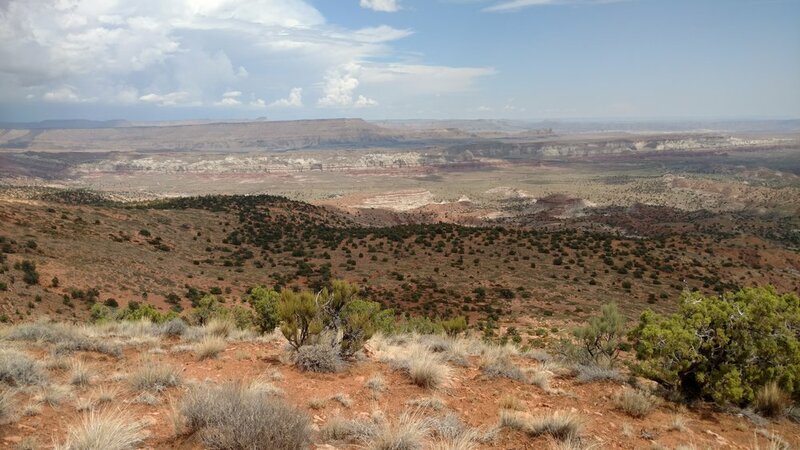 The western slope is extremely rugged with cliff bands and jagged rock. The eastern side is crumbled rock and sand. I spy a beautiful window arch in the sandstone as I stop for a break and water. The rain has sent the humidity through the roof in this generally arid place and I am sweating beyond normal with the heat. I have plenty of water so I make sure I am drinking oftern. A drop down to the final saddle before the summit push and I spy the road I was hopping to be on. Sure enough it would have delivered me directly below the summit on the eastern side. Oh well, the hike has been stunning as I make my way up the final raise. The GPS pings my arrival and I walk around the Juniper tree sitting at the summit. The view is stunning in every direction. Similar to those from Fivemile Mountain but by no means less breathtaking. No shade exists on the summit unless one is willing to crawl up under the Juniper tree. I find a spot on the western ridge that is receiving a steady stream of wind and unbuckle my pack. I move a rock and sit down on the soft dirt. What a stunning view. Almost directly below me is a circle loop around a series of trees just off of House Rock Valley road. Following the circle I think I can pick out a trail that connects up a wash; following a ridgeline to the high saddle I was just on. It is what happens when you don't or can't take the time to look for information (beta) regarding a hike. Sometimes you end up taking the long way around. With my snack and cool down complete I make my way down from the summit mound. I avoid the second climb and simply traverse a cliff band until it runs out. Working down a wash I end up on the same level as the road I had hoped to park on. Walking along the plateau I arrive at the road near the ridgeline. No other tracks are on the road as I hike back to the FJ. It's only 2:30 pm in the afternoon but what a great way to start this mini vacation.